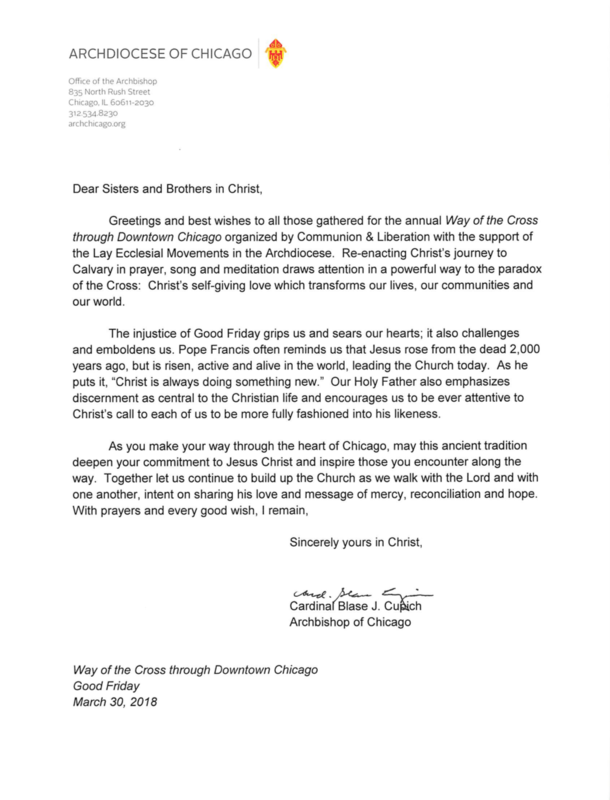 Greetings and best wishes to all those gathered for the annual Way of the Cross through Downtown Chicago organized by Communion & Liberation with the support of the Lay Ecclesial Movements in the Archdiocese. Re-enacting Christ's journey to Calvary in prayer, song and meditation draws attention in a powerful way to the paradox of the Cross: Christ's self-giving love which transforms our lives, our communities and our world. The injustice of Good Friday grips us and sears our hearts; it also challenges and emboldens us. Pope Francis often reminds us that Jesus rose from the dead 2,000 years ago, but is risen, active and alive in the world, leading the Church today. As he puts it, "Christ is always doing something new." Our Holy Father also emphasizes discernment as central to the Christian life and encourages us to be ever attentive to Christ's call to each of us to be more fully fashioned into his likeness.